Let there be light; let there be an expanse; let the water be gathered and let dry ground appear, and let the land produce vegetation; let there be lights in the expanse; let the waters teem with living creatures, and let birds fly above the earth; let the land produce living creatures according to their kinds; let us make man in our image. And God saw all that He had made, and it was very good. I was honored to take up the challenge to design and fabricate a thing of beauty illuminating these weighty words. In order to emphasize these four important proclamations, the letters were cut from a reddish fabric and then sewn with thousands of machine zigzag stitches onto the strongly contrasted light creamy-yellow wide framing border. The central curving bands are filled with simple silhouettes of a select few of the myriad of creatures and vegetation filling the waters, landforms and skies of the earth. The top curving and hanging band hints at the vast universe and celestial lights of the “expanse”. Studying the amazing intricacies and complex wonders of this magnificent earth and the vast heavens has been, and always will be, challenging and full of rewarding discoveries. In honor of the many influential pioneering scientists who believed in the Creator God, and who worked from a biblical framework making their discoveries in the 16th -19th centuries, 12 have their names “inscribed” in a contemporary font in the more subtly-contrasted narrow inner border (Pascal, Galileo, Curie, Townes, Linnaeus, Boyle, Bacon, Pasteur, Mendel, Newton, Faraday, and Kepler—renowned chemists, mathematicians, physicists, astronomers, philosophers, bacteriologists, or botanists). And since Scripture claims that all of creation was made by and for the Christ who was before all things and who holds everything together to this very day, the four corners (“cornerstones”) of the this hanging contain creational symbols used in the Bible to identify the Christ who is also the Savior: the Lily of the Valley, the Bright and Morning Star, the Vine, the wheat and the grapes signifying his sacrifice on the cross, and the Perfect Lamb of God who takes away sin and the results of the curse (the curse is hinted at by the thorny bush on the left of the bottom band of the earth forms). 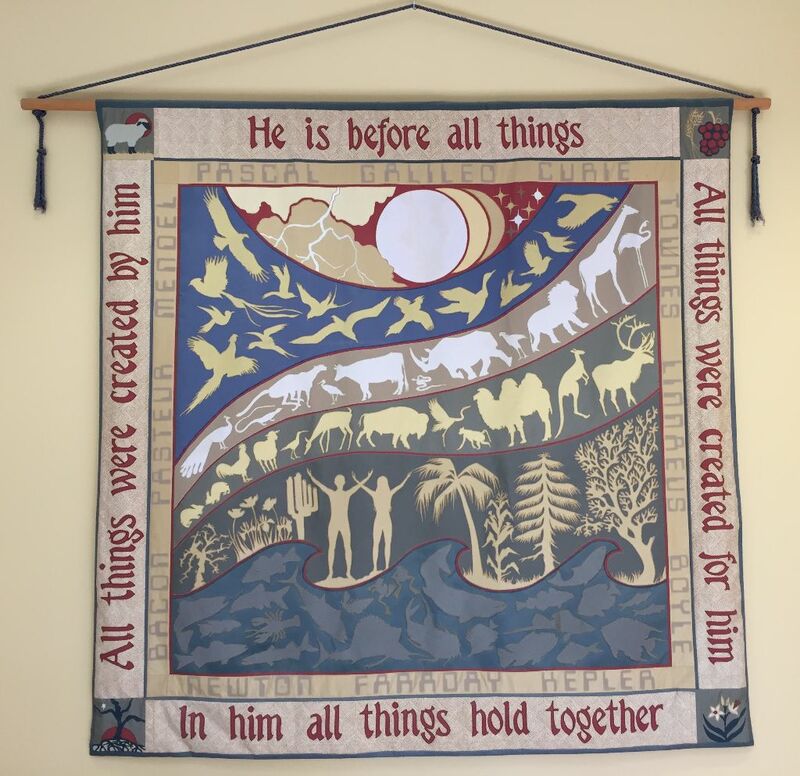 This textile hanging, like most of my work, is intended to remind the viewer of the Lord, his word and the glory due his name. The two human figures in this banner stand in a posture of praise to him, mimicking the trees and other creatures stretching heavenward. Like the laws written on doorposts and the tassels on clothing were to be reminders of God’s laws for the Israelites, such hangings can prompt our remembrance of particular scriptural truths. Christians belong to the Creator, the King of Kings, and like national flags indicate kingdom identities, such works can help identify and give visible witness for the people of faith. It is also my desire to reflect the importance of beauty in my work. God dwells in beauty. He created a beautiful world and universe. Jesus has gone to prepare beautiful places for us and God desires beauty in our worship and lives. Doreen Kellogg: All Things, 2003, banner made of mixed cotton fabrics, 5'6" x 5'6" square, Department of Science, Covenant College at Lookout Mountain, Georgia, USA. Doreen Kellogg is a self-taught artist, though she did follow some courses in art and art history at Trinity Christian College in Palos Heights, IL. and Covenant College, Lookout Mountain, Georgia. Her works can be found in many churches, schools, businesses, organizations and private collections in the USA as well as seven other countries. Her works have also been shown in various exhibits.